Sweet Peppers are loaded with various vitamins and minerals and exceptionally rich in Vitamin C, as well as containing many healthy antioxidants. They can be used fresh in salads or as a great snack, as well as sautéed in many dishes. If you are not able to use all your sweet peppers, cut them up and freeze them for later use. I love pulling my peppers out of the freezer to use in my favorite dishes during their off growing season. Freezing works for hot peppers too! Pea shoots and tendrils are the young tender upper leaves, stems and curly tendrils of pea plants and are commonly used in Asian cuisine. They are eaten like other leafy greens --quickly sautéed or stir-fried, steamed or served raw in salads. You often find them at upper end farmers markets and restaurants. They are a good source of beta carotene, vitamin C, folate and fiber. Radishes are beautiful in salads, but did you also know that they are delicious roasted or in your favorite stew or soup recipe? Once roasted or cooked, they turn into a slightly sweet and juicy vegetable that have a similar consistency to potatoes. Not only are those little beauties versatile, but they are also very nutritious! They detoxify your body of toxins and wastes, cleanse your blood, are high in fiber and vitamins C, B6, Potassium, Folate and Manganese. As well as promoting skin and heart health. Keith loves growing eggplant! It is a beautiful vegetable that can be used as a meat substitute, fixed as a delicious side dish, or in an appetizer, like Baba Ghanoush. We like to eat our eggplant roasted with a sprinkle of crushed garlic and lemon juice. We also fix it in stir fry dishes, fritatas, gratins or simply grilled. It is packed full of vitamins and minerals like B1, B3, B6, vitamin K, potassium, folate, copper and manganese. They also contain phytonutrients which helps with antioxidant activity in our body. Tatume squash (sometimes called calabacita) is one of our favorite squash! It is a rare variety that can be harvested young and tender or later for a matured winter squash. It has a sweet nutty flavor and seems to get more tasty the larger it gets. Desi Squash is the small light yellow squash that also has a mild nutty flavor. We love to eat ours roasted, grilled, or sautéed. You can also use them in soups or battered and fried. Use them the same as you would any other summer squash in your favorite recipe. To roast: Cut the Tatume in half. Oil flesh and place face down on a cooking sheet. Roast in 400 degree oven for 30-40 minutes or until tender. Seeds and skin are edible until very mature. One of my favorite ways to use them lately is as a substitute for tortiallas in my Mexican Cassarole! I love garlic! I not only love the flavor, but all the benefits of eating it! The health benefits are released as it is crushed and chopped. It produces a sulfur compound called allicin. This compound helps in reducing the risk of osteoarthritis, and protects against brain, lung and prostate cancers. It also normalizes blood pressure and cholesterol, and reduces the risk for heart disease. It is an antibacterial, antiviral, and antifungal. It fights bacterial infections, viruses and parasites. It is truly a super food! We enjoy garlic roasted and spread over one of our toasted sourdough breads. Just cut off the top of a bulb and drizzle olive oil and cover in a dish or foil and bake until soft. We use it in many of our recipes, just crushed, chopped and thrown in to flavor eggs, vegetables, or meats. Or try it in your homemade sauces, salsas or dressings. Why is Sourdough bread better for you? Sourdough is a fermented dough made from naturally occurring live yeast cultures and bacteria in flour. It is lower in sugar and higher in protein. Unlike sugary store bought breads that contains bad phytic acid, traditional sourdough breads contain lactic acid because of the fermentation process. Lactic acid increases your bodies ability to absorb nutrients, aids digestion, and promotes the growth of healthy gut bacteria. Also, during the lengthy process of making sourdough bread, the glutens get broken down into amino acids which again makes it easier to digest and better for people with gluten intolerances. You will notice that your sourdough bread lasts longer without all the artificial preservatives. This is because during the fermentation process, bad bacteria is killed off which prevents molds from growing. We use fresh ground whole wheat berries and traditional sourdough starter to make all our breads. We do this is to ensure we get all the nutrition our bodies need to be healthy! Carrots...as a fresh snack raw, in salads, soups, roasted with other root veggies (our favorite), or sauté the thinner/ baby carrots in a saucepan with butter. We love to use the short Parisian carrots when we cook roasts or soups. Can you use the greens? Yes! You can even use the greens to flavor your soups or salads! Here is some of the benefits to eating carrots...reduces cholesterol, prevention from heart attacks, warding off certain cancers, and improving vision. They increase the health of your skin, boost your immunity, improve digestion, increase cardiovascular health, detoxify the body, as well as providing the body with many vitamins and minerals. Roasted beets on a bed of fresh greens and homemade cheese. Drizzle with some Cordell's Cranberry Pear Balsamic Vinegar...Devine! Roast lightly oiled and covered beets in a 425 degree oven for 45 min - 1 hour, depending on size. Eat with skin on or easily peeled off when cooked. Beets are high in immune-boosting vitamin C, fiber, and essential minerals like potassium, manganese, copper and iron. They also contain B vitamin folate. Eat them with their greens and you increase your nutrition that much more! Use them like you would onions. Chop them up and put them in your scrambled omelet, salads, stir-fry or any dish that you normally use onions. They are milder in flavor and contain a useful amount of vitamin E, carotenes, iron, and when cooked, folic acid, vitamin C, and vitamin B1. They also have anti-cancer superpowers! The organosulphur compounds in leeks help the body kick cancer and boost immunity. This is one of our favorite Kale recipes. We served it at the Taste of Abilene and it was a hit! Simply mix equal portions of olive oil and lemon juice (3T each) and massage it into the chopped Kale. Add chopped apple and dried fruits and nuts of your choice. Salt to taste. Kale is a nutritional superfood! It reduces the risk of cancers, rich in antioxidants, and rich in vitamins like calcium and iron and other minerals. It is high in potassium and a top supplier of folic acid. What in the world are scapes? 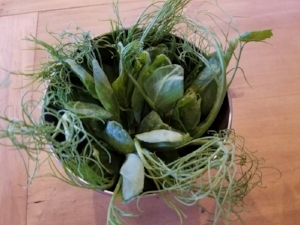 Garlic or leek scapes are a seasonal delicacy that come from the flower stalks that spring out of a garlic or leek bulb. They can be enjoyed raw in salads, dips, stir-frys, or simply oiled, salted and roasted. They are high in fiber, contain high amounts of vitamin C and pro-vitamin A...which protects your skin and lungs. They also contain many of the benefits that garlic and leeks already contain. Roasted Root Vegetables...radishes, onions, beets and carrots. The larger veggies we quarter or cut into smaller pieces. Toss in olive oil and kosher salt and roast covered until fork tender. About 45min to 1 hr on 425' oven. Sweet Southern Collards...We like to have them as beans, greens and cornbread! Throw in some natural sausage, delicious! It's an easy healthy meal we prepare and share on the farm workdays. Collards are sweet and so easy to make. Just sauté them in a little water, cover, and steam cook them. They will be tender and ready to eat in minutes. Since they are in the cruciferous vegetable family, they lower the risk of cancer, are rich in antioxidants, and contain many vitamins and minerals. They are a top supplier of folic acid and iron, as well as potassium.